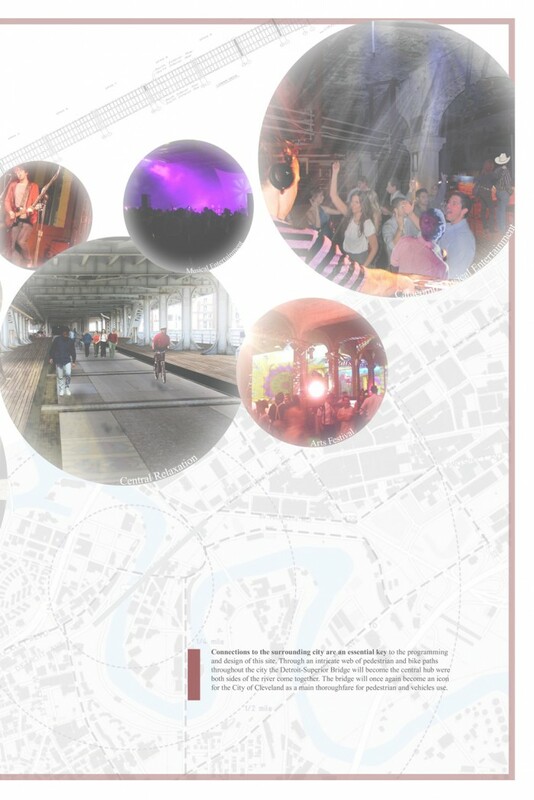 Overview: Cleveland’s essence as a city is placed in the culture of its art, recreation and theatrical entertainment. Throughout the century this essence was established by bridges connecting both sides of the river. Over the past fifty years these corridors began to close, connections were lost and the essence began to fade. 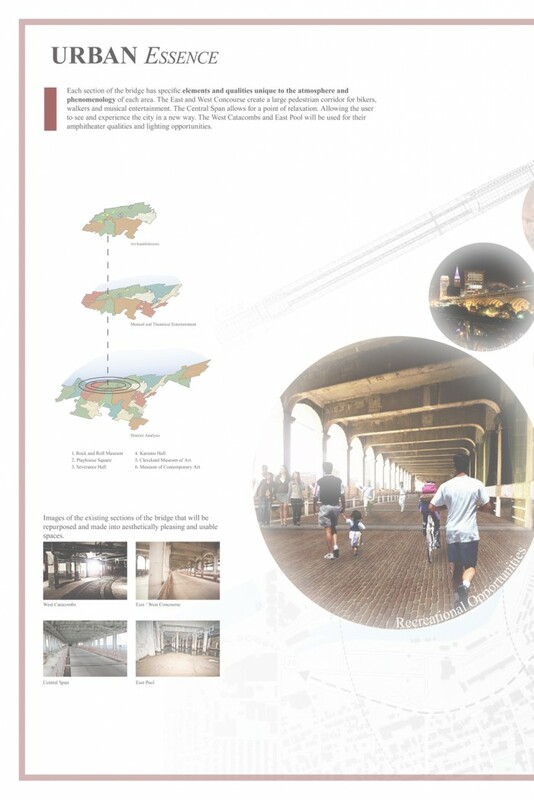 The design for the Detroit-Superior Bridge encompasses a large scale repurposing of the bridges lower deck. Each section of the bridge has specific elements and qualities unique to the atmosphere and phenomenology of each area. 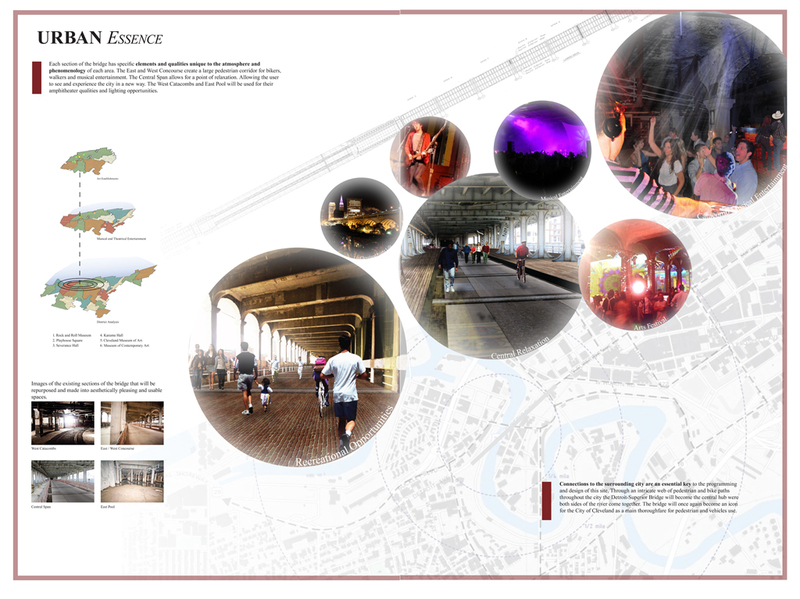 The East and West Concourse create a large pedestrian corridor for bikers, walkers and musical entertainment. The Central Span allows for a point of relaxation. Allowing the user to see and experience the city in a new way. The West Catacombs and East Pool will be used for their amphitheater qualities and lighting opportunities. Concerts, Bands and Festivals will be an essential piece to these areas. Each section poses aesthetic qualities of the city while creating a central confluence uniting the two halves of the city. The Detroit-Superior bridge will once again serve as a main pedestrian connection between the east and west side of the river creating a central corridor for the city.